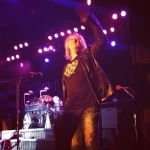 Def Leppard played the first of three casino shows last night in Santa Ynez, CA with a longer 16 song set played. The band played a 90 minute set at the Chumash Casino Resort. Their first visit to this town. The show started with the 'Won't Get Fooled Again' snippet before the band went into a longer 16 song setlist similar to the ones recently played in Mexico. 'Action' and 'Make Love Like A Man' returned to the set after being played in Mexico City and Monterrey in September. 'Let's Get Rocked' and 'Armageddon It' traded places with 'LGR' played before 'PSSOM'. Another slightly smaller scale stage set up was used in the venue which holds just 1,400 people. This was the second full show with guest Steve Brown on guitar who is standing in for Vivian Campbell while he undergoes Stem Cell treatment at a hospital in California. The next show takes place tomorrow night in Rancho Mirage, CA. Last played on 6th September in Monterrey, Mexico.